As the summer continues to fly by, it is quickly approaching that time when the search will begin for your next champion. As the costs to feed and purchase a project continue to increase, the importance and peace of mind of having a healthy pig that grows fast and efficiently is certainly one of the most crucial things on people’s minds. 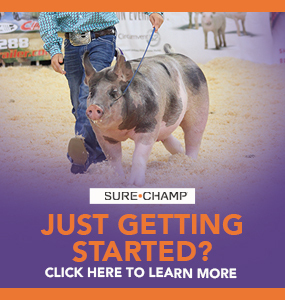 Much like starting your child in daycare for the first time or the first few weeks back to school in the fall, commingling is one of the toughest challenges we battle when buying pigs. It’s inevitable that as soon as you get a group of pigs in and settled, another group will come in right behind them. In doing so, you are naturally exposing these hogs to any type of funk or sickness that a new pig may have picked up at their previous farm or the sale where they were purchased. 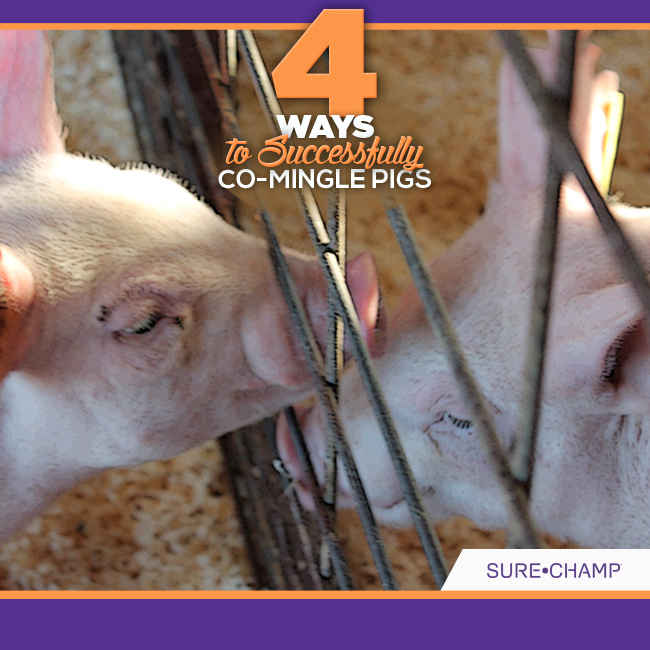 Consider these four ways to ensure receiving new pigs is a success in your barn. Pen new pigs as far away from the others as your barn will allow. If possible, keep new arrivals in another barn or area away from current pens for approximately 7-10 days to help reduce the risk of touching noses, sharing from the same water or feeders and/or being exposed to each other’s feces. Fresh, clean water is a must as water is the most important nutrient consumed by livestock. On an average day, pigs may consume up to three times more water than dry matter. Naturally livestock do not like to consume water that is muddy, contains manure, urine or algae. If this is the case, often times pigs will not consume enough water, which in turn results in reduced feed intake and effects daily gain. Clean bedding is also necessary when transitioning pigs to their new home. To avoid any setbacks, remove all bedding that was previously in place, wash and sanitize the floor area before re-bedding. We recommend dust-screened, white pine shavings for optimal skin and hair. For those who pen in dirt, do your best to remove old dirt and replace with new. This will ensure these new animals will not have to fight sick irritation or be exposed to any old fungus or allergens from previous animals. 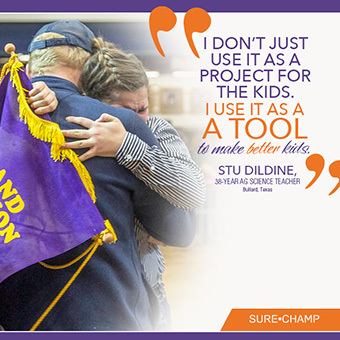 Add Amaferm® to the diet through the use of either Vita Charge® and/or Sure Champ Spark. Amaferm is a natural feed additive, that acts as a prebiotic increasing digestibility to maximize the energy value of feed. Amaferm works it’s best when fed to animals during stressful periods of their life, and therefore, works like a charm during scenarios similar to these. Vita Charge® is the quickest and most effective way of introducing the benefits of Amaferm to the diet. When you receive a new set of pigs you can boost appetite quickly as Vita Charge keeps their energy high, digestive system functioning correctly, and ultimately get pigs off to the right start to do what their genetically built to do. Vita Charge works great for that initial spark, then Sure Champ Spark is a great tool to use as a constant injection of Amaferm in their diet on a daily basis to drive appetite to higher level and improve digestive health. The added MOS traps bad bacteria, limiting their ability to do harm to digestive health and intake. 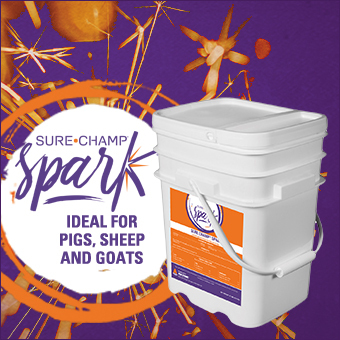 The benefit of Vita Charge and Sure Champ Spark you see is increased appetite as a result of the advantages that they allow in promoting internal digestive health.